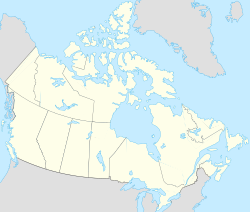 Whitehorse (tot aurie population 27,889 as o 2013) is the caipital, lairgest, an anerly ceety o Yukon an the lairgest ceety in northren Canadae. It wis incorporatit in 1950 an is locatit at kilometre 1426 on the Alaska Highway in soothren Yukon. Whitehorse's downtown an Riverdale auries occupee baith shores o the Yukon River, which oreeginates in Breetish Columbie an meets the Bering Sea in Alaska. The ceety wis namit efter the White Horse Rapids for thair resemblance tae the mane o a white horse, near Miles Canyon, afore the river wis dammed. 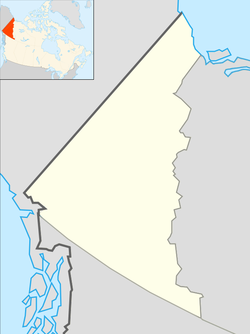 Acause o the ceety's location in the Whitehorse valley, the climate is milder than comparable northren commonties sic as Yellowknife. At this latitude winter days are short an simmer days hae up tae aboot 19 oors o daylicht. Whitehorse, as reportit bi Guinness World Records, is the ceety wi the least air pollution in the warld. ↑ Pinard, Jean-Paul (September 2007). "Wind Climate of the Whitehorse Area". Arctic. 60 (3): 227–237. doi:10.14430/arctic215. ↑ "Whitehorse". The Canadian Encyclopedia. Retrieved 2011-03-25. Wikimedia Commons haes media relatit tae Whitehorse, Yukon. This page wis last eeditit on 14 Mey 2018, at 06:28.